Projet de la semaine AED - Église rénovée des Carmélites! 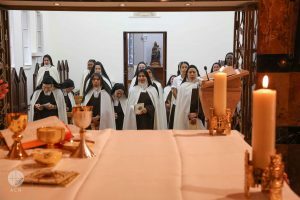 Carmelite Sisters praying in their newly renovated church in Haïfa. Photo: during Holy Mass. The Carmelite Sisters in Haifa are very happy now. Thanks to the generosity of our benefactors, ACN was able to give them 45 000 dollars so that they could finally repair their convent chapel. This church, which is dedicated to Our Lady of Mount Carmel, was first built in 1937 and has barely been maintained properly since then, owing to the shortage of money. Leaking rain and penetrating damp had resulted in extensive damage to the fabric of the building. In fact the situation had become so bad that it was becoming a growing health hazard for the sisters themselves, for the local community and also for the pilgrims coming to visit the place. 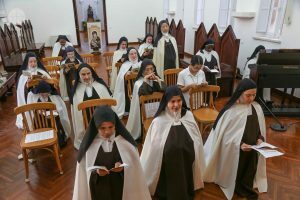 The 17 sisters now living in the convent come from 11 different countries. Their door is always open to anyone who wishes to visit. The local people often come to see the sisters with their prayers, and pilgrims from all over the world who come to visit the Holy Land also often come to the sisters, many with deep questions problems about their faith. The Carmelite convent where the sisters now live stands on the north slope of Mount Carmel, traditionally the birthplace of the Carmelite Order. It was in the year 1150 when the first group of hermits first settled here on Mount Carmel where, according to the Bible, the Prophet Elijah confronted the priests of Baal and proved to them that the God of Israel was the true God and their own ‘gods’ merely false idols (cf. 1 Kings 18:16-46). The Carmelite Order soon spread to other countries, at the same time changing, however. But in the 16th century, in Spain, it was reformed by St Teresa of Avila and St John of the Cross and returned to something closer to its original spirit. The sisters in Haifa bake hosts, or altar breads, and make small souvenirs for the visiting pilgrims as a means of supporting themselves and their apostolate. But without outside help they could never have found the money to repair their convent chapel. So it is thanks to the help of you, our generous benefactors, that they were finally able to re-consecrate this chapel on 15 October last year, the feast of St Teresa of Avila herself. A true blessing send to pilgrims, parishioners of Haïfa and also to ACN Benefactors!